GitHub has recently modified how repositories get loaded, which caused ZenHub Workspaces to also not load. We've released a fix for this, but you may be experiencing this error due to not yet receiving the extension auto-update in your browser. Force an update on your extension to get the fix following this guide! If this isn't resolving the issue for you, get in touch or follow the guide below. An in-browser window will appear. Navigate to the second tab labeled Console. If you’re seeing anything load in the console in red, be sure to take a screenshot and check for the error message title. If you're not seeing anything in red, keep the console open and try refreshing the page to reset the page. Below are common errors that appear, what they mean, and how to clear them. You can also get in touch at anytime to get help debugging. To access ZenHub Workspaces, you have to have read or write access to the repository that was used to create the Workspace. If you were invited to a ZenHub Workspace, but upon loading see that it cannot be loaded, you should check your GitHub access. Confirm you can access this repo independent of ZenHub, through the native GitHub UI. 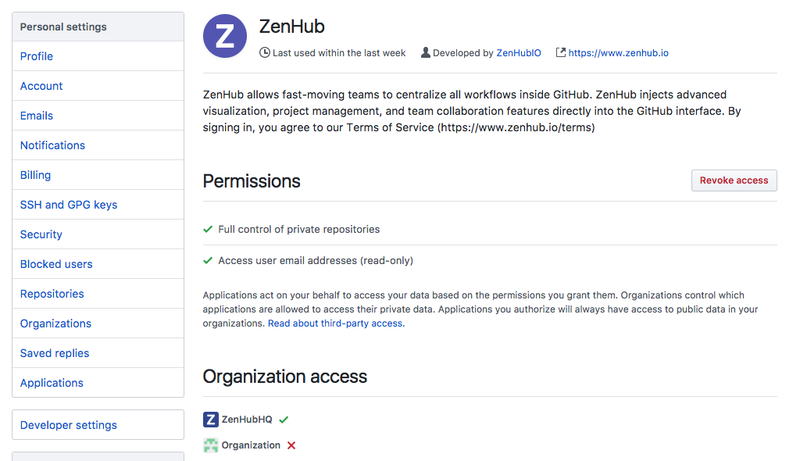 We breakdown these permissions and what actions can be taken in ZenHub in our permissions guide here. If you want a further breakdown of the permission level and behaviours in GitHub, view GitHub's permission structure help article here. Check the OAuth settings for your organization in the GitHub profile settings. Once in Settings, head to Applications > Authorized OAuth apps. If you click on the ZenHub title under the list of applications, it will display all authorized organizations connected to ZenHub. If you see a red X next to the organization where you are having issues loading your Board, it means third party restrictions are enabled for the organization. This prevents ZenHub from loading. 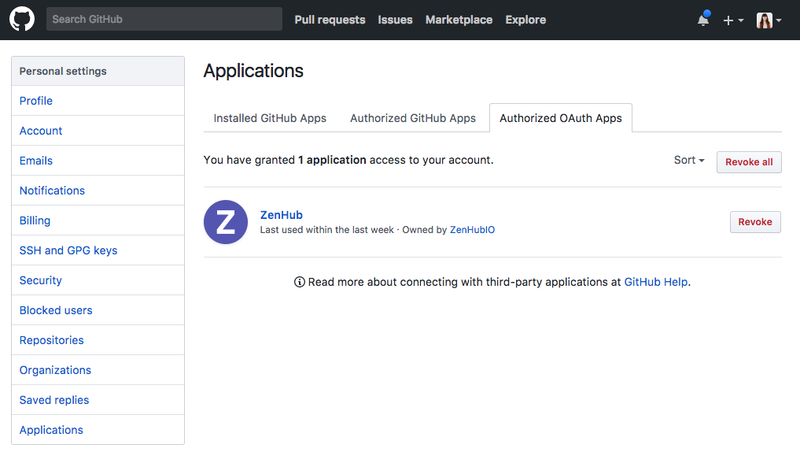 If you're an admin of the organization, the easiest way to get that access granted is to revoke your ZenHub authorization from the OAuth Apps page, and re-authenticate, but before hitting authorize you'll see a Grant button next to the organization on the page where ZenHub is prompting you to authenticate with your account. If you see a green ✓ next to your organization and are still experiencing "Something's not Zen", confirm that you have either read or write permission for this repository. If you were granted permissions within the last 3 hours, you can force ZenHub to re-check for your new permissions by revoking your token under the authorized oAuth apps section, and re-authenticating by clicking Sign in on the bottom right of any page in the extension, or refreshing the web app. If you see errors that show: ERR_BLOCKED_BY_CLIENT at the end of a long URL, there is most likely another extension in your browser interfering with ZenHub loading. Disabling all other extensions except ZenHub, and attempting a refresh. If you are no longer seeing the error, re-enable each extension 1-by-1 to identify which one is blocking ZenHub. Or, create a new profile in your Browser and re-install ZenHub. With a new profile, there won't be any data or other extensions that prevent ZenHub from responding. Disable all other extensions except ZenHub. Once disabled, refresh ZenHub and see if the Something's not Zen error disappears. If you are no longer seeing the error, re-enable each extension 1-by-1 to identify which one is blocking ZenHub. Create a new profile in your Browser and re-install ZenHub. If ZenHub properly loads in a clean profile, one of your other extensions is blocking it loading. Try re-enable each extension to see which causes the error, refreshing ZenHub after each re-enable. Load ZenHub in app.zenhub.com. If ZenHub loads properly, there's an extension conflict. If not, continue debugging below. If you’re seeing a 400 (Bad Request) or an error including rate limit exceeded or Error response from GitHub API this means you’ve gone over the amount of interactions that GitHub allows each user to perform across all integrated services (GitHub limits requests to 5000 per hour, across all your apps). These limits protect teams against abuse on the infrastructure of GitHub. Having a significant amount of information in your Board: for example, 50+ repos connected, hundreds of Epics, with thousands of Issues open. If this is the case and you are attempting to load the Velocity chart more than a few times within the same hour, it can trigger a rate limit error as the Velocity calls upon a large set of data to load. You have a custom script across any of integrated products and are using the API to run heavy requests. You have a significant amount of integrated products that are each running and making a lot calls to GitHub. If you’re experiencing this error consistently, check if you have any integrated apps you can disconnect, custom scripts that might not be operating effectively, or get in touch with us to have a chat about how to structure your ZenHub data. Reconnecting to your VPN connection. Sometimes you’ll see this error if there is a slow or weak connection. Check with your IT team to ensure you have valid SSL certificate installed in your browser. Some organizations require an org-specific certificate to be installed into a certified browser version officially supported through the organization. Confirm with your IT team that any firewall in place isn’t blocking web-sockets from connecting. The Board requires web-sockets to keep information updated in real-time. Some VPN firewalls prevent websockets from passing. When getting in touch, let us know what you’ve tried. Sharing more about your environment will help us debug faster. Are you using ZenHub with GitHub.com, or are you using ZenHub Enterprise with GitHub Enterprise? Whether you’re using the web app or extension. If the extension, the version number.